Vamos a comenzar haciendo las flores. Let’s start with the flowers. VUELTA 1: Tejemos 1 c.a.d de subida que cuenta como 1 p.b. y 11 p.b. dentro del anillo mágico. En total 12 p.b. ROW 1: 1 ch that counts as 1 sc and y 11 sc in the magic ring. 12 sc in total. Antes de hacer el p.c. de cierre cambiamos a uno de los colores elegidos para las flores y cerramos. VUELTA 2: Tejemos 2 c.a.d. de subida y 1 punto piña de 3 p.m. Sin cerrar, tejemos otro punto piña de 3 p.m. en el siguiente p.b. de la vuelta anterior. Tenemos 13 hebras en el ganchillo. Echamos hebra y la sacamos por todos los p.m. Cerramos con 1 c.a.d. de cierre. Tejemos 1 c.a.d. de bajada. Terminamos el primer pétalo con 1 p.c. en el mismo p.b. Repetir 5 veces más. En total 6 pétalos. Before closing the sl st change to one of the colors chosen for the flowers and fasten off. ROW 2: 2 ch to start the row and 1 puff stitch of 6 hdc. 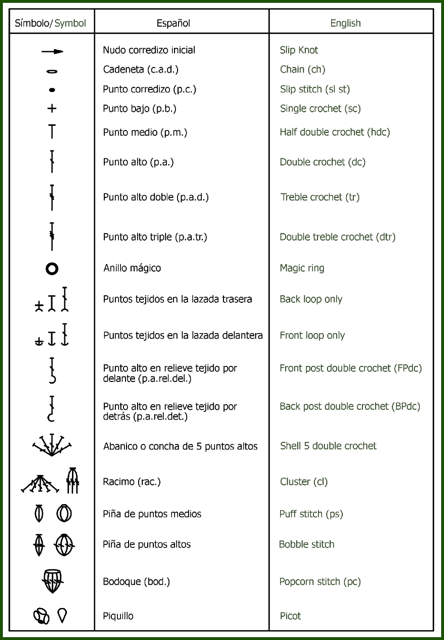 Without fasten off, make another puff stitch of 3 hdc in the next sc of the previous row. We have 13 loops on the hook. Yarn over and pull through all of them. Fasten off with 1 ch. 1 ch. Finish the first petal with 1 sl st in the same sc. Repeat 5 more times. 6 petals in total. Rematamos la flor, escondiendo el hilo por el revés con una aguja lanera y cortamos con las tijeras el hilo sobrante. Fasten off and weave in ends with the wool needle. Podéis seguir el siguiente vídeo. Necesitamos 12 flores para cubrir toda la parte delantera del monedero. We need 12 flower to cover the front of the purse. Formamos 3 filas que cubran la parte delantera del monedero. 3 flores en la parte superior, 4 en la fila central y 5 en la parte inferior. Form 3 rows covering the front of the purse. 3 flowers on top, 4 in the middle and 5 at the bottom. Para unir las flores entre sí cosemos los pétalos de las dos flores que queremos unir con pequeñas puntadas en la parte más abultada. To attach the flowers together sew the petals of the two flowers that we want to join with small stitches in the bulkiest part. Comenzamos el monedero por su base. hemos decidido darle forma rectangular para que las flores estén en el plano delantero de uno de los lados mayores. Start the purse at its base. We have decided to give a rectangular shape to give the flowers more space. VUELTA INICIAL: Tejemos una c.a.d inicial de 14 puntos. VUELTA 1: Tejemos 1 c.a.d. de subida y 12 p.b. en la c.a.d. de la vuelta inicial. En la c.a.d. de inicio tejemos 5 p.b. Continuamos por el otro lado de la c.a.d. inicial tejiendo 12 p.b. En el extremo de nuestra c.a.d. tejemos 4 p.b. Cerramos en la c.a.d. de subida con 1 p.c. VUELTA 2: Tejemos 1 c.a.d. de subida y 12 p.b. en cada p.b. de la vuelta anterior. A continuación un aumento (p.b c.a.d p.b. ), 1 p.b. en el siguiente p.b., 1 aumento (p.b. c.a.d. p.b.) Seguimos con 14 p.b., aumento, 1 p.b., aumento, 1 p.b. Cerramos en la c.a.d. de subida con 1 p.c. VUELTA 3: Tejemos 1 c.a.d. de subida y 12 p.b. en cada p.b. de la vuelta anterior. A continuación un aumento (p.b c.a.d p.b. ), 2 p.b. en el siguiente p.b., 1 aumento (p.b. c.a.d. p.b.) Seguimos con 15 p.b., aumento, 2 p.b., aumento, 2 p.b. Cerramos en la c.a.d. de subida con 1 p.c. VUELTA 4: Tejemos 1 c.a.d. de subida y 12 p.b. en cada p.b. de la vuelta anterior. A continuación un aumento (p.b c.a.d p.b. ), 3 p.b. en el siguiente p.b., 1 aumento (p.b. c.a.d. p.b.) Seguimos con 16 p.b., aumento, 3 p.b., aumento, 3 p.b. Cerramos en la c.a.d. de subida con 1 p.c. VUELTA 5: Tejemos 1 c.a.d. de subida y 12 p.b. en cada p.b. de la vuelta anterior. A continuación un aumento (p.b c.a.d p.b. ), 4 p.b. en el siguiente p.b., 1 aumento (p.b. c.a.d. p.b.) Seguimos con 17 p.b., aumento, 4 p.b., aumento, 4 p.b. Cerramos en la c.a.d. de subida con 1 p.c. VUELTA 6: Tejemos 1 c.a.d. de subida y 12 p.b. en cada p.b. de la vuelta anterior. A continuación un aumento (p.b c.a.d p.b. ), 5 p.b. en el siguiente p.b., 1 aumento (p.b. c.a.d. p.b.) Seguimos con 18 p.b., aumento, 5 p.b., aumento, 5 p.b. Cerramos en la c.a.d. de subida con 1 p.c. VUELTA 7: Tejemos 1 c.a.d. de subida y 12 p.b. en cada p.b. de la vuelta anterior. A continuación un aumento (p.b c.a.d p.b. ), 6 p.b. en el siguiente p.b., 1 aumento (p.b. c.a.d. p.b.) Seguimos con 19 p.b., aumento, 6 p.b., aumento, 6 p.b. Cerramos en la c.a.d. de subida con 1 p.c. VUELTA 8: Tejemos 1 c.a.d. de subida y 12 p.b. en cada p.b. de la vuelta anterior. A continuación un aumento (p.b c.a.d p.b. ), 7 p.b. en el siguiente p.b., 1 aumento (p.b. c.a.d. p.b.) Seguimos con 20 p.b., aumento, 7 p.b., aumento, 7 p.b. Cerramos en la c.a.d. de subida con 1 p.c. VUELTA 9: Tejemos 1 c.a.d. de subida y 12 p.b. en cada p.b. de la vuelta anterior. A continuación un aumento (p.b c.a.d p.b. ), 8 p.b. en el siguiente p.b., 1 aumento (p.b. c.a.d. p.b.) Seguimos con 21 p.b., aumento, 8 p.b., aumento, 8 p.b. Cerramos en la c.a.d. de subida con 1 p.c. ROW 1: 1 ch to start the row and 12 sc in the chain of the first. In the first ch make 5 sc. Keep working on the other side of the initial ch making 12 sc. At the end of the ch make 4 sc. Fasten off with 1 sl st.
ROW 2: 1 ch to start the row and 12 p.b. in each sc of the previous row. 1 increase (sc, ch, sc), 1 sc in the next sc. 1 increase (sc, ch, sc.) 14 sc, increase, 1 sc, increase, 1 sc. Fasten off with 1 sl st.
ROW 3: 1 ch to start the row and 12 p.b. in each sc of the previous row. 1 increase (sc, ch, sc), 2 sc in the next sc. 1 increase (sc, ch, sc.) 15 sc, increase, 2 sc, increase, 2 sc. Fasten off with 1 sl st.
ROW 4: 1 ch to start the row and 12 p.b. in each sc of the previous row. 1 increase (sc, ch, sc), 3 sc in the next sc. 1 increase (sc, ch, sc.) 16 sc, increase, 3 sc, increase, 3 sc. Fasten off with 1 sl st.
ROW 5: 1 ch to start the row and 12 p.b. in each sc of the previous row. 1 increase (sc, ch, sc), 4 sc in the next sc. 1 increase (sc, ch, sc.) 17 sc, increase, 4 sc, increase, 4 sc. Fasten off with 1 sl st.
ROW 6: 1 ch to start the row and 12 p.b. in each sc of the previous row. 1 increase (sc, ch, sc), 5 sc in the next sc. 1 increase (sc, ch, sc.) 18 sc, increase, 5 sc, increase, 5 sc. Fasten off with 1 sl st.
ROW 7: 1 ch to start the row and 12 p.b. in each sc of the previous row. 1 increase (sc, ch, sc), 6 sc in the next sc. 1 increase (sc, ch, sc.) 19 sc, increase, 6 sc, increase, 6 sc. Fasten off with 1 sl st.
ROW 8: 1 ch to start the row and 12 p.b. in each sc of the previous row. 1 increase (sc, ch, sc), 7 sc in the next sc. 1 increase (sc, ch, sc.) 20 sc, increase, 7 sc, increase, 7 sc. Fasten off with 1 sl st.
ROW 9: 1 ch to start the row and 12 p.b. in each sc of the previous row. 1 increase (sc, ch, sc), 8 sc in the next sc. 1 increase (sc, ch, sc.) 21 sc, increase, 8 sc, increase, 8 sc. Fasten off with 1 sl st.
ROW 10: 1 ch to start the row and 12 p.b. in each sc of the previous row. 1 increase (sc, ch, sc), 9 sc in the next sc. 1 increase (sc, ch, sc.) 22 sc, increase, 9 sc, increase, 9 sc. Fasten off with 1 sl st.
Vamos a realizar todo el alzado tejiendo en espiral. VUELTA 1: Comenzamos con 74 p.b. tejidos en la lazada trasera. VUELTAS 2 a 7: Tejemos en espiral 74 p.b. en cada vuelta. VUELTA 8: Tejemos 15 p.b. y 1 disminución de 2 p.b. juntos. Haremos 4 menguados por vuelta. en total 70 p.b. VUELTA 9: Tejemos 1 p.b. en cada p.b. de la vuelta anterior. Sin disminuciones. En total 70 p.b. VUELTA 10: Tejemos 15 p.b. y 1 disminución de 2 p.b. juntos. Haremos 4 menguados por vuelta. en total 66 p.b. VUELTAS 11 a 25 : Tejemos 1 p.b. en cada p.b. de la vuelta anterior. Sin disminuciones. En total 66 p.b. ROW 1: 74 sc taking the back loop only. ROW 2 to 7: Work in the round sc in each row. ROW 8: 15 sc and 1 decrease (two stitches together). 4 decreases. 70 sc in total. ROW 9: 1 sc in each sc of the previous row. 70 sc in total. ROW 10: 15 sc and 1 decrease (2 stitches together). 4 decreases. 66 sc in total. ROW 11 to 25 : 1 sc in each sc of the previous row. 66 sc in total. Elegimos uno de los dos lados mayores del monedero y cosemos con una aguja lanera mediante pequeñas puntadas los extremos de las flores al monedero. Choose one of the two largest purse sides and sew with a wool needle using a small stitch to the ends of the flowers to attach to the purse. Para colocar adecuadamente la boquilla debemos marcar los puntos centrales de los lados mayores del monedero con unos marcadores y coserlos con un hilo auxiliar a la boquilla. To properly attach the mouthpiece, mark the centre points of the sides of purse with a few markers and sew them with a thread to the mouthpiece. A partir del centro, cosemos el monedero a la boquilla hacia los lados. From the centre, sew the purse to the mouthpiece towards the sides. Hemos terminado el monedero para el Día de la Madre de este año. Esperamos que les guste a vuestras mamás tanto como a nosotras tejerlo. The purse is finished. We hope your mothers like it as much as we enjoyed making it. Gracias! Nos alegra mucho que te guste. Muy bonito 🙂 me gusta! Muchas gracias! Nos hace mucha ilusión que guste a personas con vuestra sensibilidad. Está hecho con cariño. Para una madre mucho amor y cariño.